What Do Hooters, UPS and the Army All Have In Common With Hip Replacement Patients? When Can I Stop Using Raised Chairs? When Can I Kneel Down To Worship My Spouse? [/su_box] What Do Hooters, UPS and the Army All Have In Common With Hip Replacement Patients? They all have uniforms. Because you aren’t very limber and you can’t bend down, you should plan on wearing the official hip replacement uniform: t-shirt, elastic shorts and flip-flops. This uniform will simplify your life and allow you not to stress your new hip. Wait – You With The New Hip… Not So Fast – You can ignore everything you heard in Chubby Checker’s song The Twist – no twisting for you. 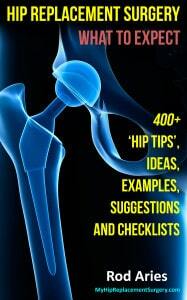 The Safe Hip Precaution Rule Of Thumb – You will have several rules to abide by after you have your surgery. They are called safe hip precautions. Imagine Jim Croce singing You Don’t Mess Around With Jim so you can envision this good rule of thumb – pretty much everything you want to normally do, but you are allowed. > Avoid bending at the hip at over a 90 degree angle. An approximate guideline for this means that if you extend your arms towards your knees, your arms should remain straight. It is important not to bend forward in your chair or cross your knees or ankles while sitting. Sit in a raised chair or an elevated surface for maximum safety and comfort. > Avoid any inward rotation of your operated leg, which means don’t point your toes like a pigeon. Don’t plant your feet and twist your body. When lying in bed, avoid reaching across your body. > Do not twist your torso inward when lying, sitting or standing. > Use an elevated toilet seat with hand rails available. > If you lay on your non-operated side, place a pillow between your knees. > Do not allow your operated leg to cross the middle of your body. > Don’t bring your knee up higher than your hip. > Sit only on elevated chairs or couches whereby your knees remain lower than your hips. > Only use chairs or couches that have armrests available to assist you standing up. > Avoid sleeping on your stomach or on your operated hip. > Don’t lean forward while sitting or as you sit down. > Don’t turn your feet excessively inward or outward. > Avoid leaning forward while sitting – this includes working at your desk. > Avoid picking up objects from the floor or bending to put on your socks and shoes, and. > Do not try out as the kicker for your favorite NFL team until you complete your rehab. No Genuflection – You will follow these hip precautions for a long time, but especially for the first six weeks. You are most at risk during this period as your the muscles, tendons, and ligaments surrounding your hip replacement require time to heal after surgery. You should not stress or flex your muscles and ligaments to prevent your hip from separating or dislocating. A dislocation of your hip can occur when the ball (femoral head) comes out of the socket (acetabulum). And absolutely no bowing down to your mother-in-law. When Can I Stop Using Raised Chairs? All the precautions above revolve about limiting the bending in your hip. The higher the chair, the easier it is to stand and the less you stress your post surgery hip. Most physicians will state you may discontinue using your raised toilet and other seats after six to ten weeks from your hip replacement operation. I used my raised dining room chair for almost a year. When Can I Kneel Down To Worship My Spouse? Even with the pain of recovery, you learn to appreciate your caregiver or spouse. You will wonder when you can place your knee, safely, on the ground. Most orthopods will recommend at least six weeks after your total hip replacement surgery. In order to safely kneel, you first allow your operative leg side to touch the ground. After you have completed thanking and worshiping your spouse, to arise, with her/his permission of course, you use your non-operative (good) leg first to get up. Abduction Brace – In some cases, a patient may be required to wear an abduction brace after surgery. This brace will wrap around your wait and thigh. It will keep your hip in proper alignment while providing support and stability. You will wear the brace at all times. The brace should be removed and replaced while only when lying down or if you are going to shower. > Back up until you feel the bed behind your buttocks. > While holding onto the crutches with one hand, reach behind with the opposite hand and place it securely on the mattress. If you are using a walker, reach for the bed with both hands. > Sit and slide your buttocks backward on the bed. I would use the crutch as a handrail and push my body up. > Pivot on your buttocks as you lift your legs onto the bed. You won’t be able to do this in one smooth move – your hip will hurt too much. I used a leg strap to lift my surgical leg onto the bed. > If it is more comfortable for you, use a pillow to keep your legs apart when lying in bed. > Reverse the procedure to get out of bed. Hip Tip – I Used A Small Step: The bed platform we have is fairly high of the ground. I ended up using a small plastic step for my good leg to push against and get up into bed. How To Get In And Out Of The Car – First note that you are not only responsible for your personal safety, you are responsible for driving safely. You will not be allowed to drive until your doctor says you may. This is often 8 to 12 weeks after your surgery. > Have your driver park as near to you as possible. > Stay away from curbs, potholes and other obstacles. > Put your body into reverse and back up with your walking aid until you can feel the edge of the car against the back of your legs. > Hold onto the back of the seat, the car frame or even the dashboard for support. Slide your operated leg forward slightly, bend both your knees, and push your buttocks onto the car seat. > Slide your buttocks toward the middle of the car then pivot on your buttocks as you lift your legs one at a time into the car. I needed a leg strap to complete this task for both entering and exiting the car. > Reverse the procedure for getting out of the car. Bigger Wasn’t Better – I have a large SUV and it was very uncomfortable getting into the vehicle right after surgery. As with the previous prehab exercise suggestion, gather an elastic bandage and a crumpled up cardboard. Put the cardboard against the bottom of your thigh as you tightly wrap the elastic bandage. Move your car seat back as far as it will go, recline the back rest to about 45 degrees, lower the seat as low as it will go and then back into your car, rear end first. Try not to hit the cardboard under your thigh as you pivot to get into your car. Try and keep the leg is going to be operated upon as straight as possible. Sitting Down And Standing Up From The Toilet – As discussed elsewhere, a raised toilet seat is essential, especially since many homes have very low toilet fixtures. Be sure to have a handicapped railing securely fastened to the wall, next practice going as low as you can and then standing up. > Slowly back up until you feel the toilet touch the back of your legs. You don’t want to be misaligned, back up too quickly and then fall backwards. > Move your operated/injured leg slightly forward, placing most of your weight on your good leg. > Bend both knees and lower yourself slowly on to the toilet seat using the counter top, sink, or grab bars for support. > To get up, reverse these steps. Hip Tip – Use Crutches To Help You Stand Up In The Bathroom: I also suggest having one of your crutches for this exercise as well. Sit on the toilet and place the crutch on the opposite side of the handicapped railing. You will use the crutch as a way to help lift yourself up. Now raise the leg with the bad hip off the floor and try and stand up. Of course you need to take precautions that the crutch is centered properly, won’t slip and that you are strong enough to lift yourself up. Alrighty… that concludes Chapter 27.